Kamryn and Rory have been trying out different sports and activities for the last year. Rory has done a few sessions of baseball and is showing some promise on the field. 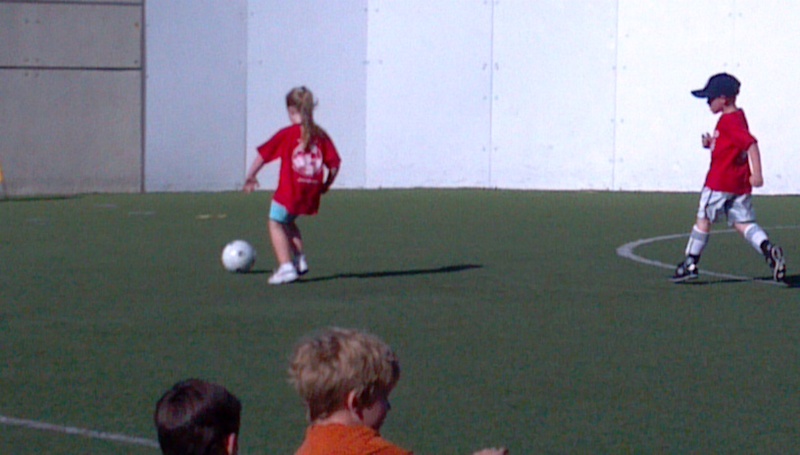 Kamryn had her swimming lessons last spring and is a good little swimmer and then tried out soccer this winter. She had fun, but wasn’t really “in to it” until the very last class. All of a sudden she started getting really aggressive out on the field. The one thing that Kamryn has really been wanting to try is gymnastics. I took gymnastics as a child, but didn’t like it. I hurt my neck one class and didn’t want to do it anymore. I wasn’t going to let my little injury influence my decision on whether Kamryn would be allowed to try it, though. Two of her friends from school were signing up as well so they could all tumble together. On Wednesday, the girls had their evaluations to see what class they would be placed in. Once the girls were done, they asked if Rory wanted to do an evaluation. I didn’t see what it would hurt and he was chompin’ at the bit to get out there and bounce around. Sure enough, the little guy was proving to be quite limber andstrong. With a quick swipe of a pen and credit card, I signed both kids up for a class and was able to coordinate them for the same time which means I get to sit and talk with grownups, without interruption for a full 45 minutes! Gymnastics was a huge hit with both kids except for the meltdowns after class. It seems that gymnastics was so much fun that real life pales in comparison. You can watch Rory bounce around on the trampoline and Kamryn balance on the beam right here. This entry was posted in kids and tagged baseball, grownup time, Gymnastics, kids, soccer by Amy. Bookmark the permalink. He had the perma-grin the entire time. This was definitely the right choice for both kids – they LOVE it. I love it! I started gymnastics when I was 3 and did it for 12 years. Ask Ryan, he got the pleasure of going to our competitions at the Iowa state fair every year 🙂 Glad they are having fun with it – burn off some of that energy! Good job Mom! 12 years? Wow! I expect you to teach the kids some backflips. They were both practicing moves last night when we got home – using the couch cushions as their mats.